Following a couple days of unsettled weather, the payoff will be a pleasantly warm Presidents' Day Weekend. It's a New Jersey sandwich! We will be in the middle of two storm systems on Wednesday: one is a weak clipper system passing to our north, the other is a stronger system with some Gulf moisture that will (mostly) stay to our south. If the timing and tracks had been different, this could have been a very wintry forecast. But snow is off the table and out the window, with only minimal impacts from both systems. First, the southern system will brush up against South Jersey and the Jersey Shore, with a period of light rain expected Wednesday morning. Next, the northern system will spread scattered showers across North and Central Jersey during the Wednesday afternoon hours. So yes, everyone in NJ may see raindrops (or maybe a few snowflakes) on Wednesday. 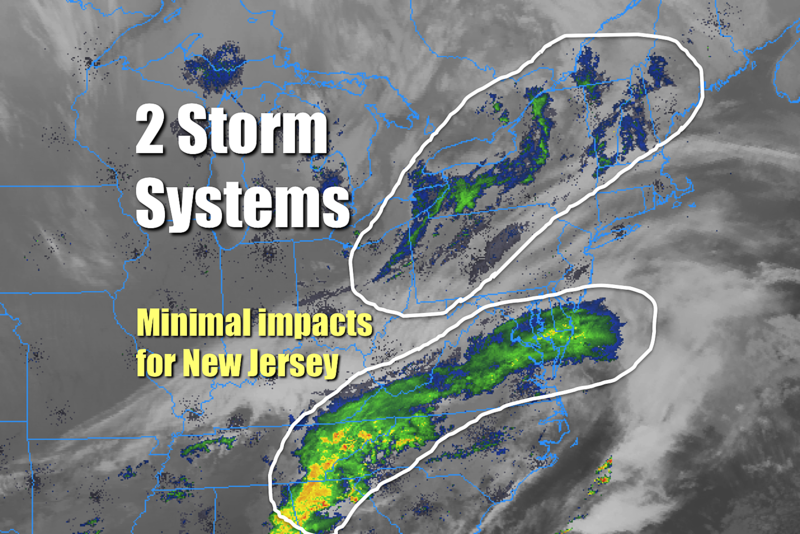 For the most part, however, these storm systems will be inconsequential for the Garden State. Meanwhile, skies will be mostly cloudy to overcast on Wednesday, winds will remain fairly light, and temperatures will be on the mild side. We should see high temperatures in the upper 40s to around 50 degrees by early Wednesday afternoon. The grand finale of this double storm system setup will be a cold front, that will begin to pass through New Jersey by late Wednesday afternoon. Clouds will decrease while winds increase. Overnight low temperatures will fall into the 20s throughout the state. Any breeze will push the wind chill ("feels like" temperature) even colder. Thursday will be colder and a bit blustery. Although not nearly as gusty as Monday's fierce wind, gusts to 30 to 35 mph will be possible during the day Thursday. Despite mostly sunny skies, high temperatures will be limited to about 40 degrees. Friday stays chilly, with lighter winds. It will be a sunny end to the workweek, with seasonable highs in the lower 40s. The Presidents' Day Weekend is notorious for bringing big snow and headaches to New Jersey. Not this year, though! With no major storm systems on the horizon, the President's Day Weekend is shaping up to be a great one for the Garden State! Saturday should feature more sun than clouds, with high temperatures climbing to around 50 degrees. Even though clouds will increase on Sunday, thermometers soar even higher - probably into the 60s for central and southern NJ! While Presidents' Day Monday will be a bit cooler, returning to the 50s, skies will remain dry and winds will remain reasonable throughout the entire holiday weekend.